If you entertain frequently, stretch tops or extendable dining table style offers the most flexibility; the table size can be adjusted to suit your needs and party size. These styles are most often featured in contemporary dining room furniture. You can find dining tables that go from four- to eight-seater stylishly. For example, there are contemporary dining tables which can stretch from 3.1 feet to 7.5 feet! My favorite comes with steel frame and top in slatted natural wood in an elegant and minimal design. The simple look belies the mechanism and workmanship that goes into manufacturing these tables. The sliver of aluminum that runs around the edge of one particular design suggests understated modern design. For dining party decor, centerpieces look best on round and square dining tables. Some of the unique round tables styles include a wooden table with strong inclined legs and rotating top. A smaller tea table from the same range has interesting cross metallic legs. 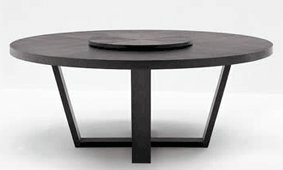 Another unique round dining table is characterized by a tension cord that holds all the components together running around the outer edge. Thus, this table comes with just 3 legs. For small dining spaces, look for tables which can switch usage at the blink of an eye…. A great dining table for small dining spaces should suggest lightness with thin but sturdy materials as well as steady construction. The picture below shows one that gives the illusion of suspension due to the light construction; its glass top rest upon a thin rod, perfectly balanced thanks to its hyperbole-shaped support braces. Consider also a square dining table that double ups as a coffee table; it has cross-framed legs that allow its height to be adjustable. With its versatile function, sleek glass top and slim frame, it’s ideal for small spaces. Click on highlighted text to return to the top of dining table style.